From my Minor Satchel Collection I gently extract a scrap of paper. Another receipt. Sigh. I am bored with these receipts; I want letters, wills, newspaper clippings. Sigh. Diligently I begin the annotation which will tag the receipt’s storage sleeve. Now this scrap is piquing my interest! What would Greene County, Pennsylvania resident John P. Minor be doing in Baltimore? 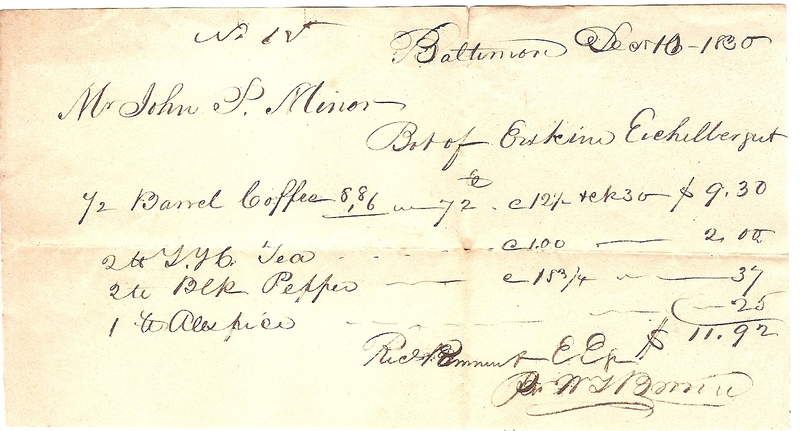 This paper doesn’t detail how my great³ grandfather came by the money, but it does detail how he SPENT $11.92 at the wholesale grocers, Erskine and Eichelberger, at the southwest corner of Baltimore and Howard Streets in Baltimore, Maryland.¹ John P. Minor bot (sic) ½ barrel of Coffee for $9.30, 2 units of T. Y. C. tea for $2.00, 2 units of Black Pepper for 37 cents and 1 unit of allspice for 25 cents. I can’t help but wonder if my great³grandmother enjoyed the tea for Christmas!